Watch out, beef. Mainstream diners are discovering what gourmands have known for years. When it comes to tender cuts, succulent sauces, and savory crusted medallions, nothing beats elk. Elk has all the wild flavor venison aficionados love but without the stronger, gamey tinge that can be off-putting. As more efforts are concentrated toward restoring elk populations in mountainous regions of the United States, elk is fast becoming the everyman’s choice in gourmet game. Chefs love working with elk, too. Overcook venison and the result is a chewy mess. By contrast, elk lends itself to diners who love a good char. Places like the Buckhorn Exchange in Denver, Colorado, serve elk two ways, grilled with a four-peppercorn crust and broiled medallions from elk farm-raised specifically for the Buckhorn. At the billionaire playground that is Azuridge Estate Hotel in Alberta, Canada, travelers get on planes for Japanese Red Seal chef Yoshi Chubachi’s elk Wellington. Even home cooks are getting in on the elk action with tacos and stews. Here are our top OpenTable picks for elk first-timers and those who can’t wait to order it again. When The Fig Tree became the first in this Southern city to serve what was then an adventurous dish, diners approached with trepidation. That didn’t last long. Fig tree owner and chef Greg Zanitsch’s grilled New Zealand elk chop remains the restaurant’s number one entrée. 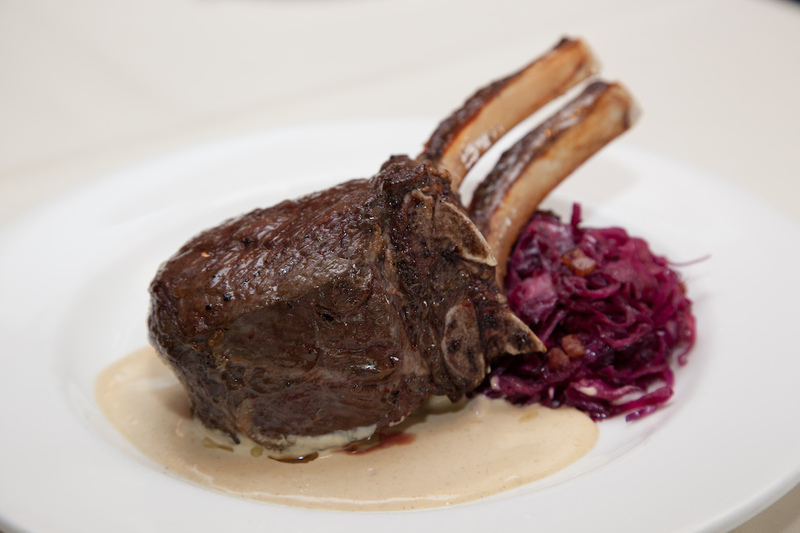 He serves it over horseradish spaetzle with smoked bacon-braised purple cabbage and Boursin-Dijon sauce. When Chef Zanitsch gets his teeth cleaned, his dentist asks if he still offers elk on the menu – the same goes for dropping his kids off at school. Zanitsch still chuckles at the queries even after more than a decade serving his signature dish, a 14-ounce chop with three bones. 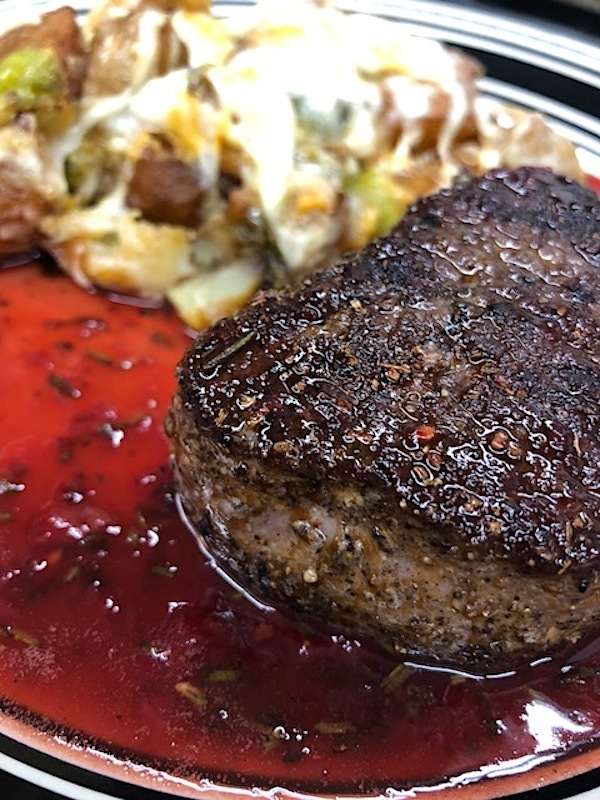 Chef Zanitsch cooks his elk chop to medium rare, since elk are more athletic than cows and therefore the meat toughens up with more cook time. He personally selects his elk wine pairings from the Fig Tree’s 31-page wine list, favoring Spanish wines, pinot noir, and Cabernet. Make a reservation at The Fig Tree. Cloak & Petal has only been open for several months, but dishes like chef Dominic Valenzula’s elk sashimi are already making headlines. Aside from having one of the coolest names in the restaurant business, Cloak & Petal is a convergence of culinary culture. 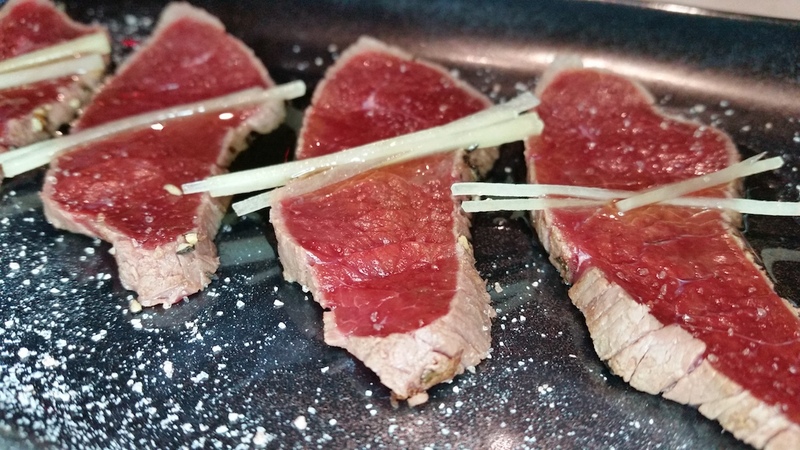 The elk sashimi is infused with ginger, sesame oil, and salt, sourcing elk from a Wyoming farm. The preparation is daunting from equipment to plate. The restaurant staff purchased a special freezer to freeze the elk to 80 degrees below zero to properly store and prepare the dish. It is then lightly seared on the outside to add a little smokiness. The sesame oil is from Kyoto, Japan, and is a much lighter version than its pungent, Americanized cousin. Make a reservation at Cloak + Petal. Canadian menus are nothing if not carnivorous. 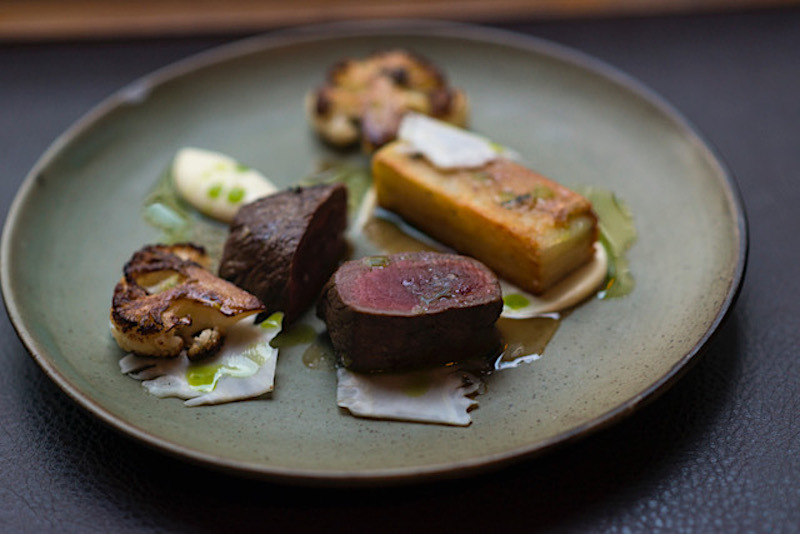 At Wildebeest in Vancouver, chef Ian McHale serves a roasted elk loin with crispy potato terrine, pickled and roasted winter vegetables, rosemary oil, and dark chocolate jus. The sinfully delicious dish is right at home in the refurbished 19th-century building in the city’s historic Gastown district. Make a reservation at Wildebeest. The newly opened Emporium Kitchen and Wine Market is in the Old Town neighborhood of Fort Collins. 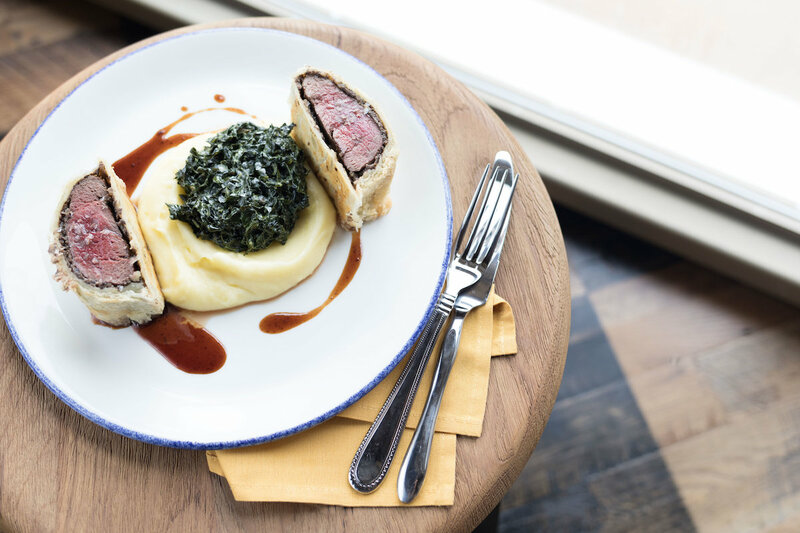 At this American take on a brasserie, executive chef David Anderson serves his elk Wellington as a Saturday special, prepared with elk tenderloin, puff pastry, mushroom duxelles, creamed kale, and Yukon gold mashed potatoes. Make a reservation at The Emporium Kitchen and Wine Market. Proprietress and culinary director Holly Arnold Kinney doubles up on flavor with her duo of four-ounce, bone-in elk chops St. Vrain, which she grills and serves with wild Montana huckleberry preserves at The Fort. What makes this dish so special, aside from the irresistible flavor profile, is The Fort itself. Kinney’s passion for what she terms ‘new foods of the old West’ is reimagining 19th-century recipes in this full-scale adobe replica of Bent’s Fort, the 1833-1849 fur-trading fort originally in Southeastern Colorado. Make a reservation at The Fort. At Trattoria Roma, chef Matt Prokopchak prepares a seed-crusted elk loin with coriander, cumin, fennel, and mustard seeds cooked in a cast iron skillet. 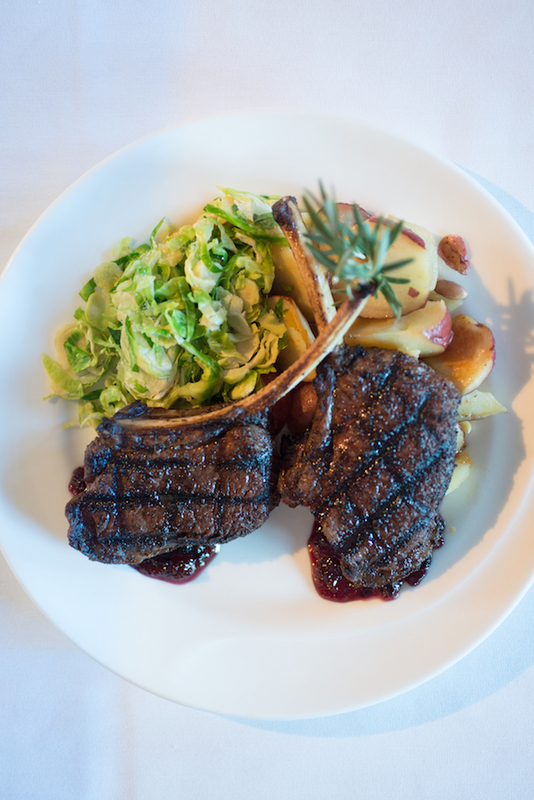 He garnishes the elk with a housemade wild berry jam glaze and serves it with Brussels sprouts, roasted chestnut, and Yukon potato au gratin. Don’t forget a glass of Prokopchak’s favorite elk-friendly wines, preferably Dolcetto, Barolo, Amarone, or zinfandel. Make a reservation at Trattoria Roma. The historic Y.O. Ranch Steakhouse is where chef Tony Street makes hunters and coffee lovers swoon. 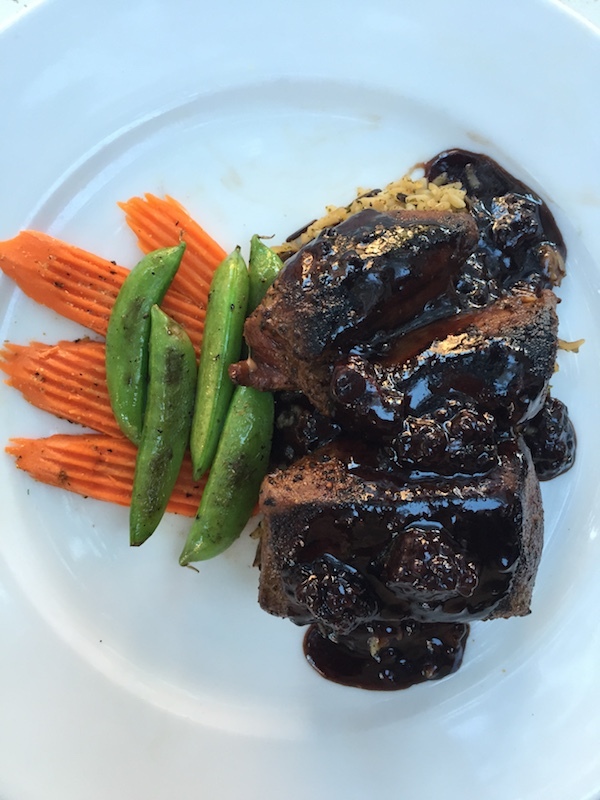 He pairs his espresso-crusted elk tenderloin with a blackberry port reduction. Street’s passion for working with game shines through in his advice to diners new to elk: “Elk holds all the flavors and textures we love about meat — but won’t make you loosen your belt come the end of your meal.” Make a reservation at Y.O. Ranch Steakhouse. 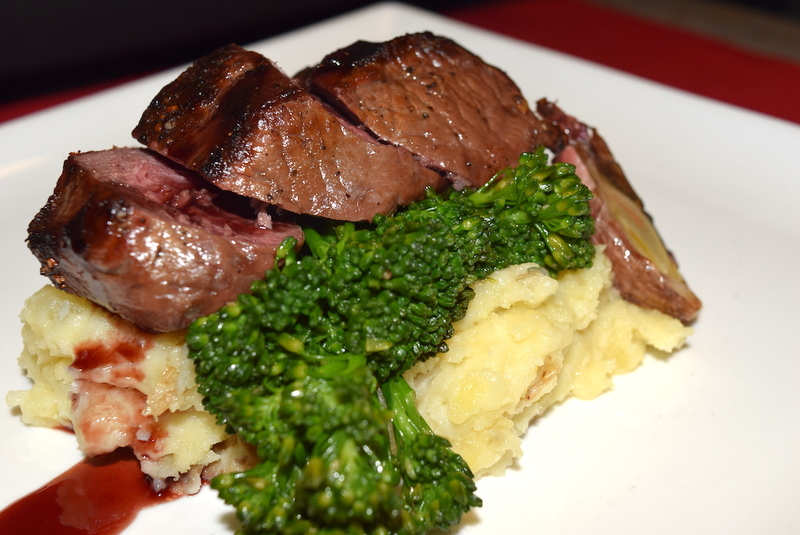 Patrons gallop to chef Scott Ostrander’s Red Stag Grill for his Mountain River elk loin. Prepared with celery root, Yukon mashed potatoes, broccolini, and a Shiraz gastrique, he bestows the perfect balance of earth, fruit, and sweetness. He chooses the short loin, which Ostrander refers to as the New York strip of elk. The agreeable mix of potato and celery root mash complements the richness so often associated with elk, finished with his Shiraz gastrique, reduced with berry preserves from local producer Imladris Farm. Make a reservation at Red Stag Grill. Where have been seeing purple dishes on menus? Tell us here or over on Facebook, G+, Instagram, Pinterest, or Twitter. And, remember to snap + share your #dishpics with us on Instagram for a chance to win in our weekly giveaway. Photo credits: EatDrinkBeSD/Michelle Stansbury (Cloak + Dagger); Sage Restaurant Group (Emporium Kitchen); Rachel Adams (The Fort); Jonathan Norton (Wildebeest).